Much like friends, types of Sunday mornings, or books — there are many different kinds of desserts. Sometimes you may be in the mood for a light French cake piled high with summer fruit. Other days, a thick slice of fragrant pound cake will do. And then there are those days when you crave a rich chocolate mousse that you share after a night of good conversation and a little too much wine. But let’s be honest. When it comes right down to it, the most basic and unassuming dessert of all is sometimes the only one that will do. A good and simple affair. Vanilla ice cream. So I want to talk about that today–about a dessert that withstands the test of time, that will always be there for you. A dessert that is far from trendy, that doesn’t play favorites or trick you into thinking it’s something that it’s not. It’s a good foundation. A solid beginning. And solid beginnings? They’re important. The wonderful thing about starting a relationship over the phone and getting to know one another as people, friends, confidants –well before you’re anything more– is that there’s a great deal of trust in that. There’s a good foundation. It makes me feel as if I’ve known Sam for a very, very long time. But lately it’s been delighting me to discover the things that arise that I don’t know about Sam. They’re small things, things people ask me that catch me off guard because after exactly 1.2 million hours on the phone (no exaggeration; we’ve been keeping a log), I don’t know the answer. There is an apple farmer who does amazing farm breakfasts and lunches at the stand next to me at the Saturday farmer’s market and she just started doing a lovely oatmeal with fresh cream and butter, berries and nuts; I thought to myself, Ah, I wish Sam were here! He’d love this. Then I realized, I have no idea if Sam likes oatmeal in the mornings. Or ever. So I call and we clear that up (he does). Or he’ll call to ask me: Do I like Golden Retrievers? Would I ever want one? (Yes, and sure). How do you feel about Ayn Rand (meh)? Favorite season (fall)? Almond milk: yay or nay (yay)? There are questions that arise. Casual questions, light questions. But questions, still.. All quietly building upon a foundation. Adding to it. So this recipe today is all about foundations and quietly building upon them. 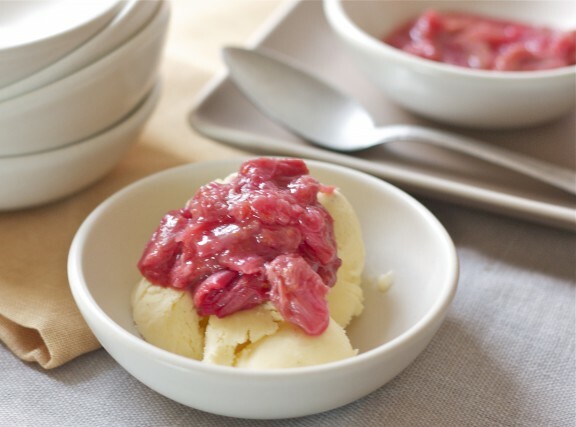 My springtime obsession with rhubarb is in full swing, so in addition to this simple vanilla bean ice cream, I made a baked rhubarb compote (also known as spring in a spoon, if you ask me) to ladle on top. It’s as easy as slicing up a few stalks, adding in a bit of orange zest, a little orange juice and a dash of sugar and baking it into a rich, pink mess of goodness. I’ve been eating it often at all times of the day. I highly recommend a bit for breakfast on top of toasted baguette or random spoonfuls when you need a little happiness in the late afternoon. Because hey, sometimes you can get carried away with the more elegant desserts, the showier cousins. But when it comes down to it, good and simple is what sustains you. 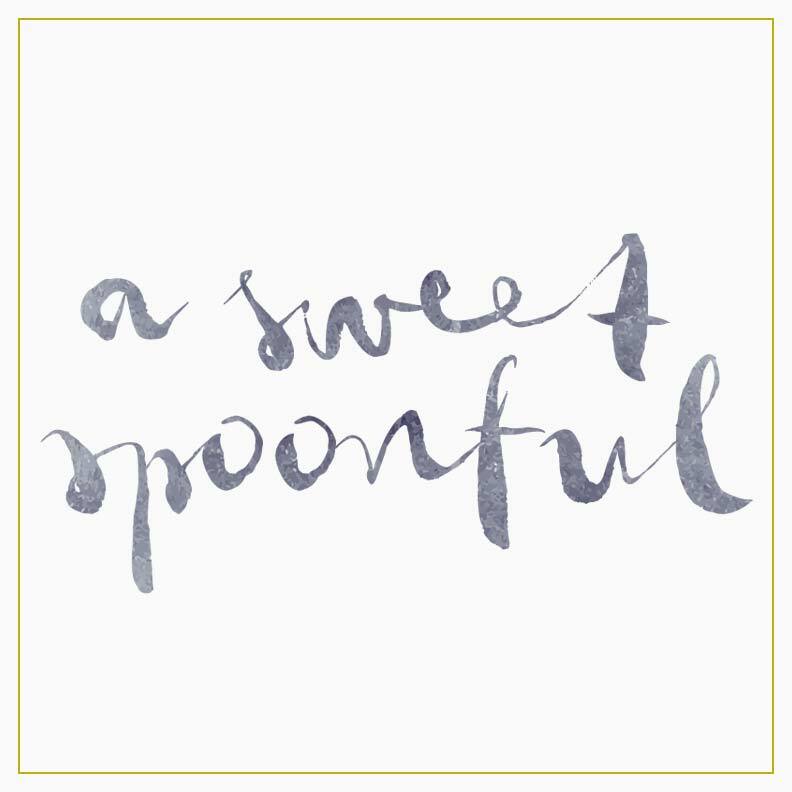 That goes for a small bowl of sweetness at the end of the day. It also goes for making future plans with a new love because you can see it all taking shape and it just makes perfect sense. Because it falls into place so, so easily and seems so good. So simple. Because there’s a certain faith in all of that. This is the perfect go-to vanilla ice cream recipe. Do be sure to let firm up for several hours before serving. In a mixing bowl, quickly whisk the egg yolks just until they’re broken apart. Set aside. Slowly heat the milk, sugar, and salt in a medium-sized saucepan. Split the vanilla bean lengthwise, scrape out the seeds with a small knife and put the pods and seed right into the milk mixture. Stir slowly over low heat until the milk is steaming and the sugar’s dissolved (don’t let it come to a boil here). Slowly pour the milk mixture into the egg yolks, stirring constantly.Pour the mixture back into the saucepan and set aside. Pour heavy cream into a clean mixing bowl and set aside. Now, cook the milk and egg mixture over low heat until it thickens just enough to cover the back of a spoon (right around 170). Remove from heat right away and strain though a fine-mesh sieve into the bowl with the heavy cream. 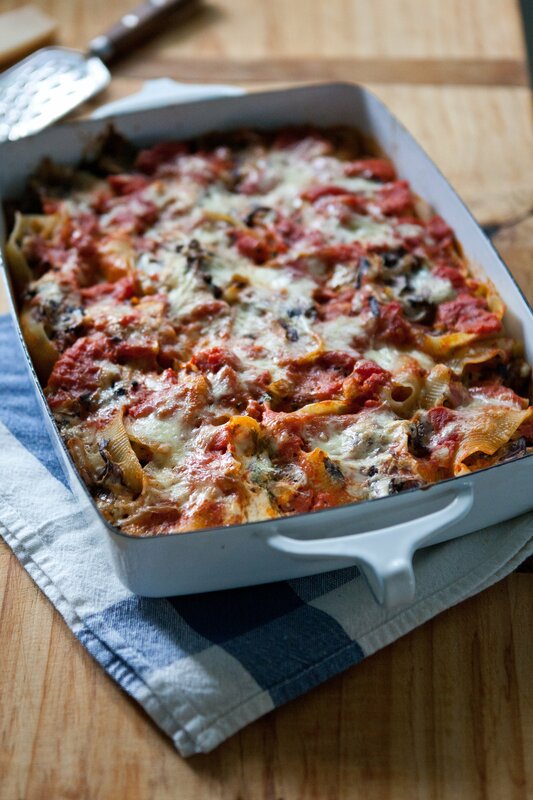 Whisk together and place in refrigerator to chill fully, at least two hours. Freeze according to your ice cream machine’s directions. Alice Waters calls for 1/2 cup sugar in her recipe and I’ve found that with good, ripe rhubarb you can get by with a heaping 1/3 cup. It will be on the tart side this way. If you’d like it just a little sweeter, go with Alice and the 1/2 cup. 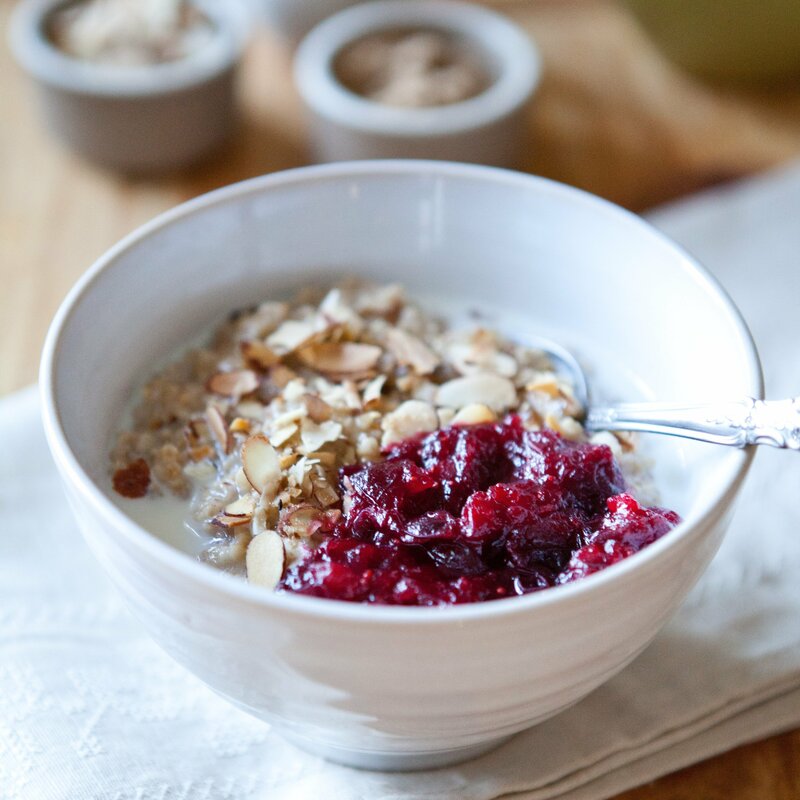 This compote is wonderful with your morning oatmeal, atop yogurt or cottage cheese, layered in between layers of cake or served with ice cream. As we have it here. Preheat the oven to 350 F. Rinse the rhubarb and wipe dry. Trim off the leafy ends and the tough bottom at the end of each stalk. Cut lengthwise into 1/30inch-thick strips and then crosswise into 2-inch pieces. This should yield 5-6 cups. Grate the zest of the orange into a nonreactive baking dish and squeeze in 3 tablespoons of its juice. Add the rhubarb, sugar, and pinch of cardamom and toss everything together until the rhubarb is coated with sugar and juice. Cover and bake for 25 minutes or until a knife slides easily into the rhubarb. While warm, spoon onto vanilla ice cream. praise rhubarb and all it's tartness! i just made something similar last night :). Although the ice cream sounds really good, it is a cool morning here and now I want Rhubarb on oatmeal. Too bad it is a month until our rhubarb comes up. rhubarb + Ice cream ? Im in! That compote looks positively delicious ! I cant find Rhubarb here in Argentina very easy, but I´ll keep the recipe for when I do! Oh, we made rhubarb crisp over the weekend. Delish! love those kinds of conversations. This subject is dear to me, as Hugh and I had a long distance relationship for many years, and I remember all this stuff fondly :) It's so neat to get to a place where you can guess what your loved one will pick from a dinner menu, or naturally make a certain type of cookie cause you know its his favorite. These things come with time and questions, enjoy it! I see potential for Marge to make and sell seasonal compotes and sauces as ice cream toppings, pie fillings, etc! Oh, thanks Lori! Such a good idea, actually...I like it! So nice to meet someone else who is as obsessed with rhubarb as I am! I was just looking at that recipe in the Chez Panisse "Fruit" cookbook, so I guess this is a sign that I need to get busy and make this gorgeous dish. My cheeks feel all tingly just thinking about it! 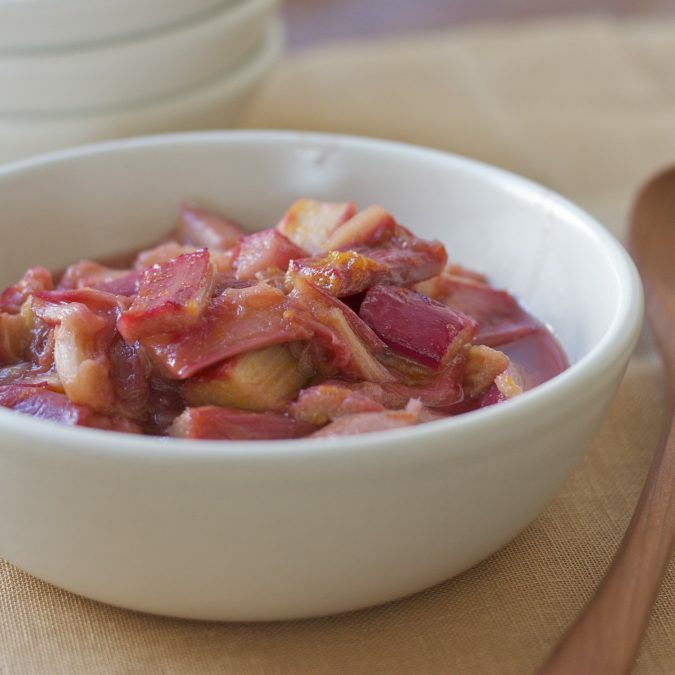 Did you see the Rhubarb~Grapefruit Preserves recipe in the "Fruit" cookbook? Ooh la la. Hi Brook! I did see that recipe and actually turned down that page...it's going to happen here very soon. If you make it, let me know how it is. So nice to "meet" you, too! Love the comment about it being "spring in a spoon" which is so true and such a beautiful way to put it. Sweet foundations and spring in a spoon! Bring it on! I love your posts and your photos here are making me weepy, in a good way. I'm all for sweetness and goodness and spring - I just wish spring were here now because I keep forgetting that it's May! I adore both rhubarb and vanilla ice cream. It's funny, I eat mine in reverse -- a bowl of rhubarb topped with a small scoop of ice cream. I know I'd like it your way too. Cheers to solid foundations. another beautiful piece, megan. love the chez panisse fruit book. i bought two original prints from it: figs and grapefruit. have you visited her studio? amazing. hanging on the walls are some of the famous menus she did for chez, etc. cheers to you + sam! btw: meant to say: patricia curtan's studio. it's worth visiting next time she has an open house in oakland. Oh, thanks for the tip, Mary! I'll put it on my radar. 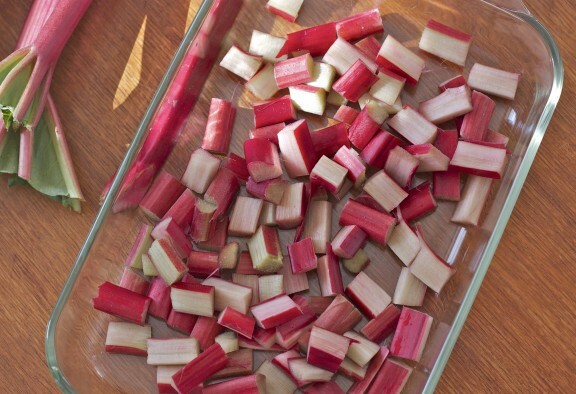 Made your rhubarb last night and ate it with Greek yogurt -- yum! Oh, yay Denise! So glad to hear it...I need to make another batch. 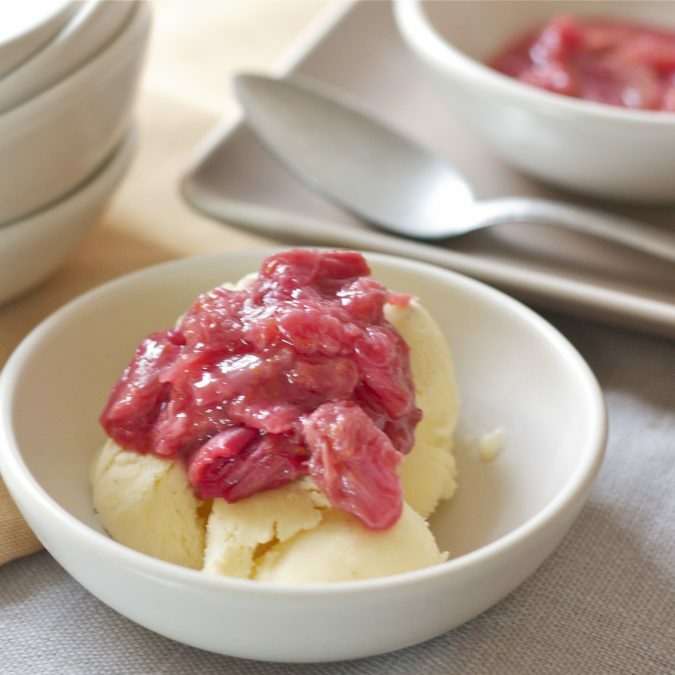 i made vanilla ice cream recently and the rhubarb seems like the perfect pairing. delicious and fresh! I love your photographs and story behind this dessert. Vanilla ice cream is my go-to basic dessert every time. 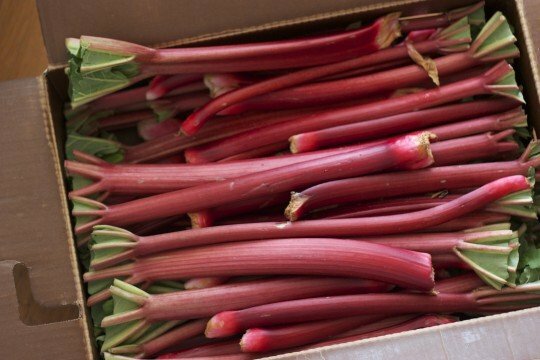 I haven't used rhubarb yet this season, but your gorgeous pictures have inspired me to hit up the market soon and get on it! Thanks for sharing this.